Is there a better alternative to PerfectLum? Is PerfectLum really the best app in Science category? Will PerfectLum work good on macOS 10.13.4? PerfectLum is a software to calibrate and verify medical displays that are used for diagnostics or viewing of medical images coming in widest sense from biological- medical- Imaging, radiology, radiological sciences, endoscopy, Tomography, Ultrasound, medical photography and microscopy. PerfectLum needs a review. Be the first to review this app and get the discussion started! PerfectLum needs a rating. Be the first to rate this app and get the discussion started! Qubyx offers PerfectLum 3 Display Calibration software and PerfectLum Suite, a Display Quality Assurance suite - both based on the medical standards NEMA DICOM part 14 GSDF, AAPM TG18, DIN 6868-57, JESRA X-0093 and IEC 62563-1. 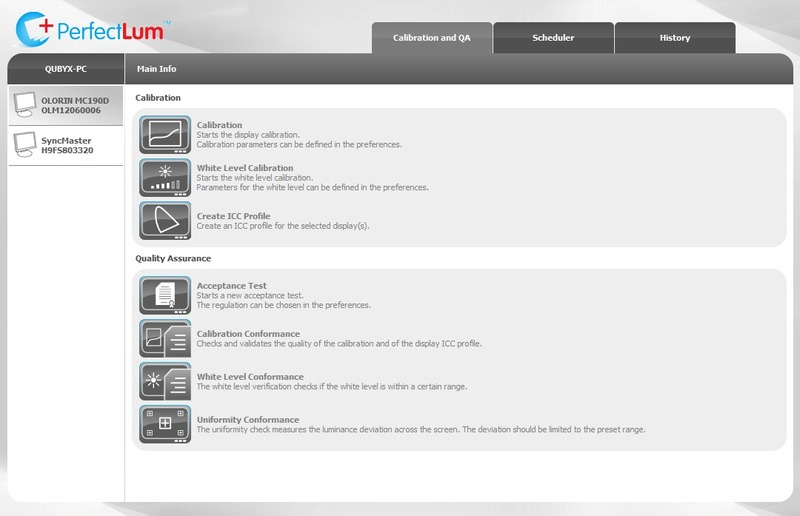 PerfectLum 3 is designed for calibration to these standards, while PerfectLum Suite software performs calibration, acceptance test, conformance test and maintains consistency to all medical workstations. Use of this software enables health-care professionals to maintain their displays to international standards and quality. Runs on Mac OS X, Linux, and Windows. Calibration of all displays to the DICOM part 14 GSDF and CIE L* standard. Updates video card LUT or display LUT for displays that comply with the DDC/CI standard. Performs acceptance and conformance test. Schedules conformance test automatically and reminds to perform tests. Test Patterns to visually check calibration results. Supports calibration of multi-head display systems. History log for comparing and checking the results of calibrations and QA tests performed. Supports many brands of photometer. License supports all users on the installed Workstation. perfectlum.com utilizes expiring download links for the demo, an e-mail address is required for download. Thank you.